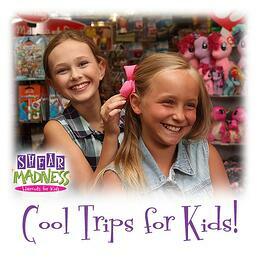 Kids Favorite Destinations to Combine with your Shear Madness Haircuts for Kids Visit! If you're like a lot of parents, you're usually trying to find something fun and memorable for you to do with your kids on summer vacation or for a fun family weekend trip. That's why we thought it might be fun to come up with some of the big attractions in each city where a Shear Madness Haircuts for Kids is located. Because like a lot of these great places listed below, Shear Madness is also a magical destination for kids where haircuts, parties, salon services and a fantastic kids boutique filled with toys, hair products, jewelry and more are waiting for parents and their kids to discover! So don't miss out - the following locations where each Shear Madness is located are also home to some of the coolest places for kids too. Have fun checking out these cool trips for kids! Des Moines / Ankeny: Did you know that Des Moines Iowa is home to the Adventureland Amusement Park? That's right! According to their website, "Adventureland Amusement Park and Adventure Bay Waterpark contain over 100 rides, shows, and attractions including some of the country's most exciting roller coasters and thrill rides that can challenge the most avid amusement park enthusiasts." Also of note is the Science Center of Iowa, which "engages and inspires visitors by bringing learning to life...With live science demonstrations, a 50-foot planetarium and a six-story IMAX dome theater, there's always more to explore!" And of course any trip to Des Moines wouldn't be quite complete without stopping by Shear Madness Haircuts for Kids in West Des Moines (across from the Jordan Creek Mall). But don't forget - you can also visit one of our cool stores while in Ankeny too! Albuquerque: If you're visiting Albuquerque, New Mexico, you may may want to check out the ABQ BioPark, a cool environmental museum comprising four facilities: Aquarium, Botanic Garden, Zoo and Tingley Beach (fishing lakes). Each of the facilities is designed to help foster environmental awareness, education and stewardship. Meanwhile, Cliff's Amusement Park is the only place in New Mexico with Family Rides, Thrill Rides (like the New Mexico Rattler, one of the Top 25 Wooden Roller Coasters in the world), Kiddieland and Cliff's WaterMania! Great games and good food, too! And lastly, any visit to Albuquerque wouldn't be complete without stopping by Shear Madness Haircuts for Kids in Albuquerque at Paseo Del Nort & Wyoming! Lee's Summit / Olathe (Kansas City): Named one of the country's 25 best science centers by Parents Magazine, Kansas City's Science City provides over 200,000 visitors annually with an engaging environment ripe for exploration, experimentation and discovery. Plus, the historic Union Station (which Science City is a part of) is also a must-see destination in itself. Additionally, the Kansas City Zoo is a 202 acre zoo that is home to more than 1,300 animals. In 2008, the Kansas City Zoo was voted one of America's best zoos, and was ranked number one in the nation for “African Animals and Exhibits". The Zoo was also ranked among the top 10 in the nation for “Australian Animals and Exhibits”. Also, you won't want to miss checking out Shear Madness Haircuts for Kids in Lee's Summit or Olathe! Amherst, New York: With over 7000 artifacts on display, the Medina Railroad Museum amazes all ages with it's largest toy train layout in New York State, collections from the late 1800's to present, and huge collection of fire safety equipment! Also nearby, the Buffalo Zoo offers guests fascinating animal exhibits, naturalistic wildlife habitats, beautiful garden areas and several unique areas in which to enjoy an environment that is full of fun, adventure and history (all throughout the year). The Buffalo Zoo is open daily rain or shine - just like Shear Madness Haircuts for Kids in Amherst, New York! Check it out! San Antonio, Texas: At SeaWorld San Antonio, kids will love getting up close and personal with a dolphin, as well as penguins, beluga whales, dolphins, and flamingoes! There's also crazy roller coasters (including one of two “hypercoasters” SeaWorld has throughout the US) and water rides as well! After a cool visit to Sea World, you may want to visit the San Antonio Zoo, which is a great place for kids who love animals, learning, and learning about animals. Finish off this memorable day with an equally memorable visit to Shear Madness Haircuts for Kids at the Forum in San Antonio, or at the Village at Stone Oak (also in San Antonio)! McAllen, Texas: The International Museum of Art & Science is a Smithsonian Affiliate and is the premier art and science museum of South Texas (containing over 50,000 square feet of exhibit space). The museum provides a unique opportunity for visitors to participate in hands-on science exhibits and to learn original works of art while encouraging creativity and innovation. IMAS’ Permanent Collection includes Folk Art, Fine Art, Decorative Art and a modest Geological Collection. Meanwhile, Quinta Mazatlan is a beautiful urban sanctuary that seeks to enrich people's lives through educating about birds, plants, and environmental stewardship in South Texas. And of course, you won't want to miss out on also visiting Shear Madness Haircuts for Kids in McAllen, Texas! Coming Soon! Shear Madness Haircuts for Kids in California (Lake Forest / Irvine area) or Humble, Texas! Both of these exciting destinations will be open soon for kids and parents to visit! Stay tuned!